It’s been a while since I’ve featured an original drink at Two at the Most, so this seemed like an excellent time to try something new. Aside from the occasional Ramos Gin Fizz, I rarely use milk products in cocktails, although I frequently use egg whites! 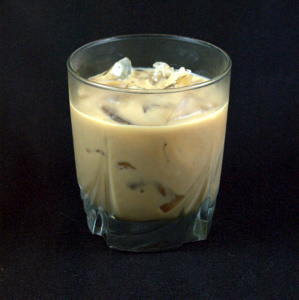 I do have a favorite nightcap, which is an ever-changing combination of rum, milk, and creme de cacao. For MxMo, I wanted to experiment with that idea, but create something a little more complex. I have been enjoying the bottle of Kahlúa Cream I received as a sample, and have enjoyed it with rum as well, so I used that as a base. I haven’t worked too much with the bottle of Zwack I also received to sample, although I greatly enjoyed the lunch the brand sponsored for Drink.Write 2009. When I added it to my rum and Kahlúa Cream, I was surprised at how well it worked. I added my current favorite bitters, Bittermens Xocalatl, to add an additional layer of flavor, and was really pleased with the result. Shake over ice until well chilled, then strain into ice-filled old fashioned glass. The bitter herbal Zwack keeps the sweetness of the Kahlúa Cream in check, and the rich dark rums rounds out and ties the flavors together. I can also imagine trying these flavors together with warm milk for a nice winter drink. What is your favorite way to use cream liqueurs? Thanks to eGullet for this fun theme. Be sure to check the forum to see everybody who has participated! This recipe idea is terrific. Its amazing how throwing in Zwack makes so many cocktails come alive! I threw my own spin on it though: I used Captain Morgan Private Stock for the dark rum and I subbed khalua with the new creamy Baileys. To die for Winter Warmer!